Millions of children and adults on this planet have difficulty reading. One of those people is my wonderful Wife. She was diagnosed with a form of dyslexia at 20 years old. After a few years, I grew accustomed to her everyday battle with reading and writing and an idea came to me. With much delay, I put together a book that is the first of its kind. It’s more of a simulation of a reading barrier, rather than a novel. Let’s just say first, I’ve always been a word nerd. I’ve been doing little word puzzles since I was a small boy. Scrabble, Boggle, Crosswords, Word-finds, Mad-Libs, and Mad Gab, were all my favorites growing up. So this fascination with words and the English language was always there. As a teenager, I found myself effortlessly slipping puns into everyday conversation, much to the dismay of my classmates. It wasn’t until I got married to a Dyslexic that I realized how thankful I need to be for this superpower. Not only was I now aware of how hard it must be for those with reading difficulties, but it reopened a can of worms I had stumbled on in high school. I wrote a sentence on a scrap of paper and promptly lost it. Years later, that same sentence on a scrap of paper would be the inspiration for the first-of-its-kind book “Flecks You’re Mined”. I started slowly, writing down phrases comprised of mostly homophones used improperly. My intention was simple. I wanted to test my wife’s reading skills against the average reader. What I discovered was remarkable. She didn’t seem to be fazed by the misspellings and misplaced words. At first, I was surprised. 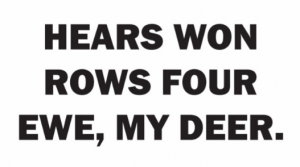 Then I remembered people with reading difficulties may see words entirely differently. Some have learned to rely almost largely on phonetic decoding strategies, as it is hard for them to form a stable mental representation of a word’s spelling. Some prominent brain researchers have reported that dyslexics bypass a part of the brain called the “visual word form area” that is part of the reading network for skilled, non-dyslexic readers. With my book, my wife reads the sentences without much effort. After about 3 years of jotting down phrases, I was pressured into actually turning this concept into book form. A relative (who happens to be a teacher/tutor for dyslexic kids) heard me talking about the book concept and couldn’t wait for me to get it completed. I went window shopping and found that the only books out there for teaching homophones are children’s picture books. This further fueled me to push onward and find time to sit down and thump away at the keyboard. 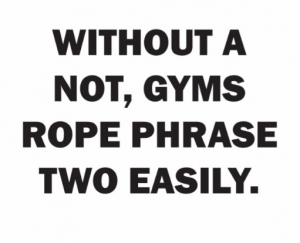 Writing 75 phrases spelled completely wrong was mentally exhausting. As you can probably imagine, it messed with my head. Sometimes I would go back and read the sentences I had written just five minutes prior and would struggle to remember what it was supposed to say. I liken the writing process to riding a unicycle, or learning to juggle. Once the brain created the pathways, something clicked and all of a sudden I forgot how to spell, and writing improperly became easy. Weird. Writing the answer key or “Headache Relief” as I call it- was terrible. Sometimes I would type the sentence 3 times before getting all the words spelled properly. I was a little worried that I had rewired my brain and would struggle with writing forever. Thankfully, after a few weeks I regained my ability to write using the proper words and spellings. So now here we are, with a complete book of nonsensical phrases. Although many dyslexics might breeze through it, the average reader is left blinking and stumbling over every word. Often times needing to read it out loud to understand. I hope this provides an opportunity for someone with dyslexia to share with their peers or parents what it feels like to struggle with reading. Regardless of whether this book is used for learning or for leisure, the intention of this book is to simulate what it would be like to lose your ability to read. This was not written to poke fun at anyone with reading difficulties, but rather to shed light on the reading process. 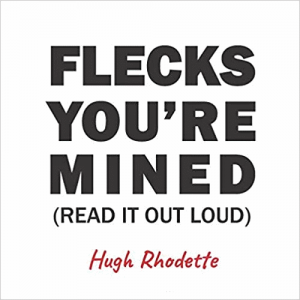 Hugh Rhodette is the author of Flecks You're Mined, a book built around homophones.